Did you know there is also a CarePair App Available for iDevices? If you would like to use CarePair on the go, you can via the CarePair App which can be downloaded free from the iTunes App Store. When you first access the CarePair app you will be asked to sign in using the CarePair Account details that you have for your account. When you sign in using your account you will either be accessing the app as a carer or as an employer. First, lets log in as an employer and explore the CarePair App. When you log in as an employer you will be shown your employer's menu page which has five options. The first option is the red button, 'Add a job'. If you touch this button you will be taken through the steps to add a job to CarePair. Simply follow the onscreen instructions and enter the details. The next orange button, 'My Jobs' allows you to see the jobs that you have posted. You will be able to see your current open jobs, and your previously posted jobs. 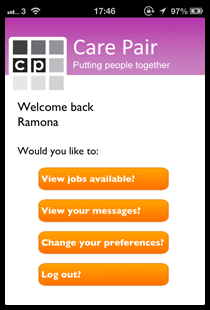 By touching a job in the job list, you will be able to see the carers that are available. 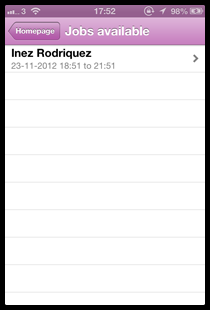 The next button, 'My Preferences' allows you to choose whether your contact details are shown. Lastly, touching 'Log Out' will log you out completely from the CarePair App. After you have posted a job, you can view it in your 'My Jobs' section of the CarePair App. Once you are in the 'My Jobs' section, touch a job and you will be shown a map, with all the available carers shown as a red pin. Your job is shown as the green pin. If you want to look at the profile of a carer touch their red pin and then their name will be displayed. Once you see their name, touch the blue arrow ball to be taken to their profile summary page. When you are on the summary page, you will be able to see the details of the carer that you have chosen. You can see how you match in terms of social preferences like music, films and social events. You can also see when they are available to work, and what they are willing to help you with. If you like the sound of them, you can contact them via the contact button at the top of the app, and either contact them via a call, a text or a CarePair message. 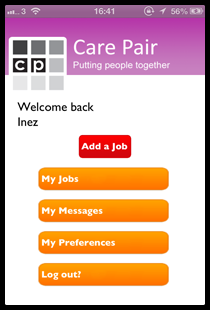 So, that is the employer's side of the CarePair app, its simple to use and makes the task of finding a carer easy. 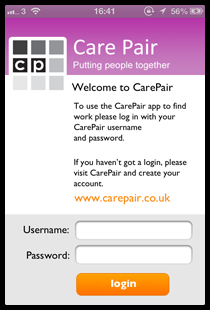 Lets now take a quick look at the CarePair App from the carers perspective. The first thing the carer needs to do is log in, and that is done on the same first screen as the employer. The CarePair App then knows which screen to show next and if you are a carer, it is the carer menu screen! On the carer menu screen you can see four orange buttons. The first 'View Jobs Available?' will take you to a list of jobs ready to be filled. The 'View your messages?' button will take you to your CarePair messages. The 'Change your preferences?' button allows you to choose whether you show your contact details, and lets you list whether you are looking for work or not. Lastly the 'Log out?' button logs you out of the CarePair App. When you touch the 'View Jobs Available?' button you are taken to the Jobs Available list. On this screen you will be shown the name of an employer, and the hours of the job they have available. If the hours fit with the work you are looking for, touch their name in the list and you will be taken to the next screen, which shows more information about the job. After you have touched the name of an employer in the jobs available list, you will be taken to the job information page. In this page you can see the name of the employer, their address if they have chosen to display it, the hours of the job, the rate per hour and at the bottom of the screen the details of the job. These details include activities they need you to carry out, and more general information about the shift. If you touch the employer name, you will be shown their profile summary, and if you touch their address, you will be shown their location on a map. From this screen you can also use the 'Contact this employer' button to call, text or CarePair message them to show your interest. Touching the address of the employer will show you the location of the job, in relation to your location as a carer. Use the 'Back' button to go back to the job information page, and then contact the employer if you'd like to fill the job available. 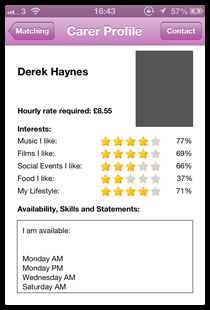 The Employer's Profile page will show you to what extent you match on the social preferences. It will also show you the skills that they require the carer to have, and the statements that they'd like you to agree with. 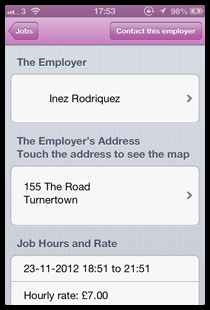 If it sounds like you can fill the role, touch the back button to return to the job information page.